I have been wanting a star burst mirror FOREVER, but haven’t wanted to spend the money that is required for the size I wanted. 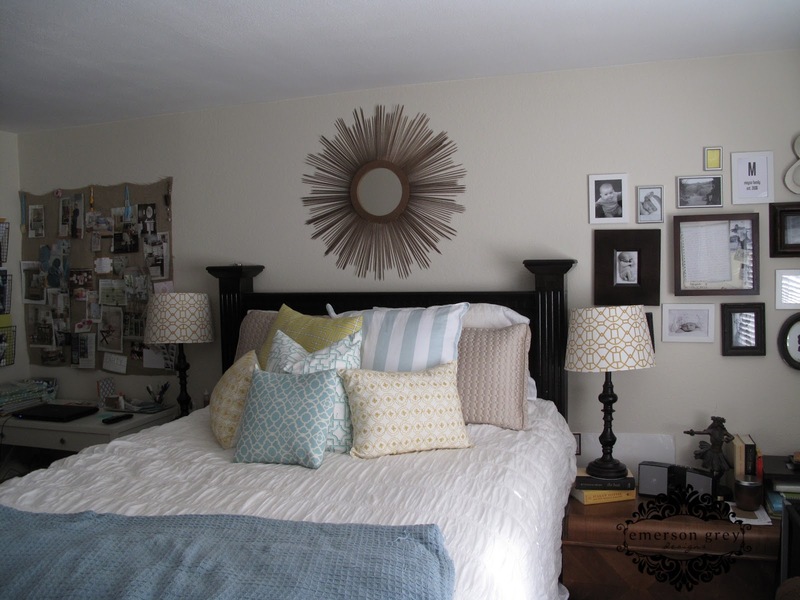 (end result 34″ diameter) I wanted a true statement above my bed. I have a fairly good size headboard that is the darkest espresso, so it really grabs your attention when you walk in the room. 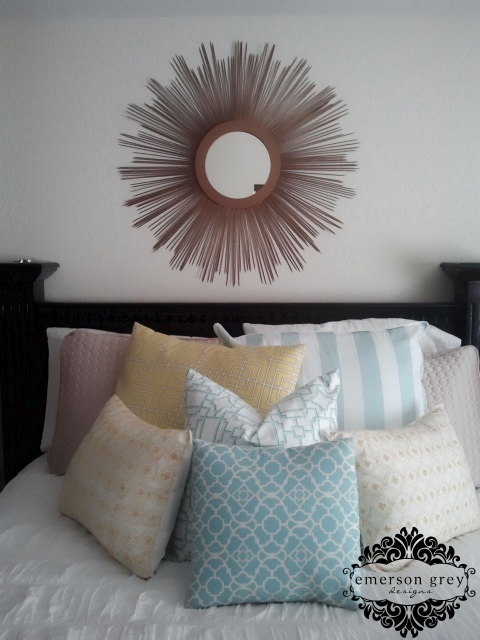 I wanted to put something above the headboard that would take the attention away from my bed…and I love how star burst mirrors always seem to do this. 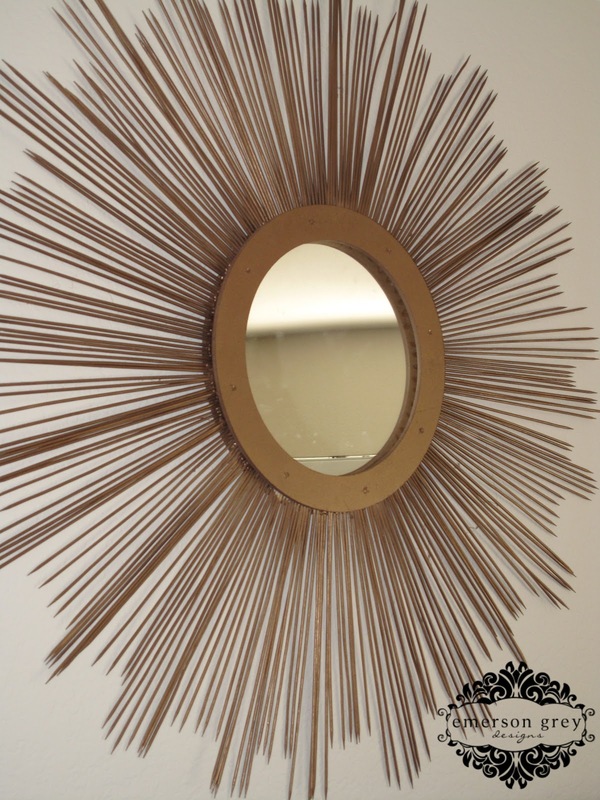 I’ve used many in my design boards and always hear about how much everyone loved the mirror. So, it was officially time for project star burst mirror. My first step…which I am so glad I did before hand was put on the hardware that I wanted my mirror to hang from. I screwed on a picture triangle thing =) yeah, don’t know the name of it, but any type of picture hanger would work. Nothing like a decorative basket of oranges as a press. Next helpful step was to create a grid. This grid acted as a guideline throughout placing the skewers. Don’t skip this part, I found it super helpful. It also created a symmetry of spacing. Trust me…it gets a little overwhelming when you have hundreds of skewers ready to be glued. I then started gluing. I first put three skewers at the end of each tapped grid line. Again, acting as a guide. This is where I discovered a few issues. A star burst isn’t a star burst if there isn’t variation in the lengths of the skewers. My skewers were all 12″ in length…so I began breaking them. Yep, with my bare hands I broke off about two or so inches off the end of each skewer. Don’t worry about being precise, it adds to the character of the rays. Again, more gluing. Using the already glued 12″ skewers guide, gradually glue skewers from longest to shortest towards the center of each section and then back towards the longest to the other pre-glued skewers. The above picture shows a few sections completed. Don’t stress yourself out about perfection here…trust me when it is on the wall you won’t tell if you don’t have the exact same number of skewers in each section…I never counted once. Here is the finished picture of gluing the skewers. I then cut out a circle from craft paper I had laying around in my kids room to cover the mirror. I knew my second circle was going on top of where the skewers were glued, therefore if my tape hung over onto the skewers a bit, it didn’t matter. Spray paint time! I choose a bronze spray paint with a bit of metallic sheen, I didn’t want it too shiny. After the paint tried, which was so quick, I then used my E-6000 glue again and glued a circle around the wood circle and then did a circle of the glue right outside the edge of the mirror, again pressing them together for a few minutes. I had to share my cutest little helper and support. Once the last circle was glued to the front of the mirror, I was all done. I really liked the idea of adding this extra circle to the front because it hid all the yucky glue issues you have after getting the skewers to adhere. Trust me you want to use a lot of glue. And there it is, I wouldn’t say it is perfect…but she sure is pretty!!! Can you make one for me? !